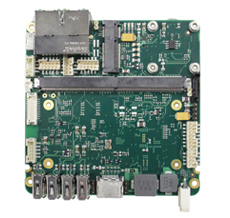 EZ-ROJ-10 SMARC (Smart Mobility ARChitecture) carrier board is an expansion board suited for Roj EZ-ROJ-1 modules and has been designed following the eNUC (embedded Next Unit of Computing) SGeT standard. Offers a rich set of interfaces, scalable performances due the possibility to mount several kinds of modules, extended operation temperature (-40°+85°) and high power supply voltage range (4,9V-24V), long term availability. PCB dimensions are 101.6mm x 101.6mm. A complete host Linux environment “ready to use” is available through a virtual machine disk image for Oracle ™ VM VirtualBox.